The present lot is part of a well-known group of bottles, made in some quantity for the Court, usually in sets of ten or twenty bottles. The Court had a large, constant demand for snuff bottles for the many members of the Imperial family as well as for gifts to be widely distributed. 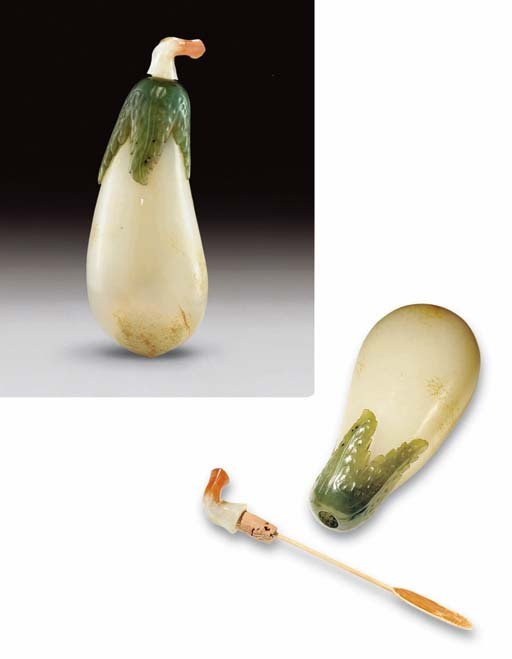 Apart from the sets in the Imperial collection (see Snuff Bottles in the Collection of the National Palace Museum, pp. 142 and 145, nos. 112 and 115), others are known, including a number of individual bottles in collections which may originally have been parts of a set. Sets of ten or twenty often indicate an Imperial order, or a tribute to the Emperor. Individual examples are illustrated in Moss, Graham, Tsang, A Treasury of Chinese Snuff Bottles, Vol. 1, Jade, no. 70; and in M. Hughes, The Blair Bequest. Chinese Snuff Bottles from the Princeton University Art Museum, p. 39, no. 4. It has been suggested that the aubergine is a symbol of fertility, as it is fast-growing and each fruit has numerous seeds, which may explain why so many sets of these were made. Apart from its obvious symbolism, the form of the fruit would have lent itself well to connoisseurs of snuff bottles - its shape providing a pleasant experience as it was clasped in the hand.